Some of you have asked if we are still in an Avian Free Zone. In a word, no – we have moved from an AFZ to an AZ. But, first a little bit about our viewing area – the patio. The courtyard is completely surrounded by stucco walls – south by our neighbor’s house wall, west our garage, east our “Great Room”, and north our bedroom and a lower outside wall with a wooden gate. At the intersection of the Great Room and our bedroom is a round dining room – and all three of these rooms have basically floor to ceiling window views of the patio. The ground portion of the paved outdoor area is covered with large stone slabs on the walking/sitting area, and small gravel stones in the section where our three trees (one Maple, two side-by-side Aspen) bury their roots. The Maple, at the bedroom end of the patio, holds our three bird feeders – (1) a pottery fish which hangs horizontal to the ground allowing the birds to enter and eat in solitude and currently filled with a blend of sunflower chips, hulled white millet, and shelled peanuts; (2) a “stackable” feeder from Wild Birds Unlimited with (at the moment) food disks of Cranberry, Naturally Nuts Suet, and Peanut and Tree Nuts; and (3) a square wire cage suet feeder. All of which is to say that we have pretty much non-stop visual access to the AZ from the time we pull back our bedroom curtains, during our meals, and through our reading/TV watching. This is what we have been seeing. It began with one extremely cautious chickadee’s stop-explore-and-go visit inside our fish diner. Then, a few days later one more…then two…then several of the small black-capped birds. According to Marsha’s research in our “Birds of New Mexico” Field Guide all of these guys are Mountain Chickadees. 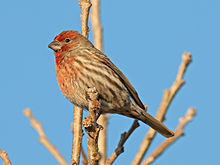 We also now are getting on a daily basis small flocks of House Finches and plain old sparrows. 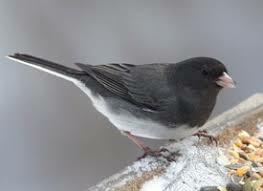 And, after we saw them arrive and leave looking frustrated, we now get small gatherings of Dark-eyed Juncos who prefer to dine from the ground, and whose needs we now are meeting with three small piles of the sunflower/millet/peanut mix on the patio stones. The little gray ground-eaters also seem to enjoy doing their strange little Junco Two Step ground-scratching maneuver in the gravel bed. 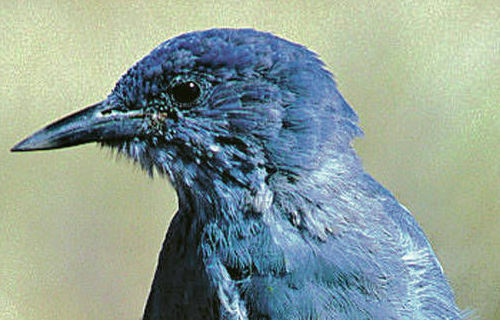 And these food mounds are now attracting a Pinon Jay, a species that according to our local newspaper (Santa Fe New Mexican) has a special hankering for peanuts in the shell, which he apparently flies away with and cracks open in the privacy of whatever area provides him privacy. Our nuts are shelled. So the first few visits he pecked, looked disgusted, and left without taking anything. Now, apparently deciding that he was after all still getting his legume fix, he has been showing up pretty much one or two times every day. And twice we have spotted a Spotted Towhee – by far the most striking of our visitors, and like the Pinon Jay a completely new sighting to our east coast bird watcher eyes. There is a flock of pigeons in the area but they haven't found us yet. And the ravens/crows don't know about the feeders – or perhaps these types of birdseed don’t attract them. Or it could be that the two-foot tall plastic Owl on the roof that came with the house is doing its job. There is a small hawk in the neighborhood, so far unidentified, and not in our yard. Either the birds we feed aren’t to his taste, or maybe he is waiting for them to fatten up a bit more. A quick bird count from our bedroom window just showed a dozen eager ground eaters. And, even when we are not watching, we can still see the shadows of descending diners on our stucco walls and window curtains. So Marsha and I have now cast aside our fears of having to live in an Avian Free Zone, and are eagerly looking forward to more new southwestern birds and new foods to keep them coming back. Unfortunately, now that we are officially in an AZ it gives people one more reason to confuse what southwestern state it is that we actually live in.